The popularity of Wing Chun in the recent years has to give credits to those movies that depicted Ip Man . As we all know movies want to entertain the audience, so they often used the creativity license to show the movie characters' Kung Fu. But, how good was Ip Man's Kung Fu in real life and how was it like in real combats? Grandmaster Ip Man had many students throughout his life, yet very few of them actually had the opportunity to see how he fought. Two of his Hong Kong era students not just had the opportunity to witness how he fought, they got to "experience" it themselves. Maybe we could get a sense of Grandmaster Ip’s Wing Chun in real fights through how he defeated these two students. Both of these two students had prior martial art experiences and both wanted to test Ip Man’s Kung Fu. They became Ip Man’s students after they were defeated by Ip Man. They were Leung Shueng and Wong Shun Leung. In the movie “Ip Man 2” had a scene of Wong challenged Ip Man. In “The Grandmaster” and “Ip Man – Final Fight” had scenes of Leung Shueng challenged Ip Man. Movie is movie; the fight scenes are more elaborated and exaggerated. Then, what really happened? How Grandmaster Ip Man defeated his two future students? One can find different versions of the story on the internet, here I use his own account. Wong Shun Leung recalled his fight with his Sifu: “When I first joined, I sparred with his two students and beat them even before Ip Man had taught me anything. But then Ip Man fought with me, and I felt the way that Ip Man beat me was so smooth, and was convincing that I wanted to learn from him. Ip Man controlled me without hitting me at all. He stopped my punches and I recognized that I had been bettered.” As a matter of fact that several of Ip Man's students have said that when they did Chi Sao with their Sifu he never strike them but controlled them. Comparing to Wong’s fight, Leung Shueng’s fight with Grandmaster Ip Man was more a bit of mystery, since there weren’t a lot of information on the fight, except Grandmaster Ip Man beat him. I was able to find an article written by one of Leung Shueng’s students. Following is an excerpt (I took the liberty of translating it from Chinese to English.) from that article: “When Ip Man first moved to Hong Kong due to the unrest in China, he stayed in an old temple. Don’t know how the words got spread out that he had learned Wing Chun. At that time, Wing Chun Kung Fu was little known in Hong Kong. There was a big guy who was a real martial art nut. Due to his curiosity, he went to the temple wanting to experience Wing Chun. He told Ip Man his purpose of visiting him. Ip Man was a man with slight stature comparing to this big guy, so this person didn’t think much of Ip Man nor his Wing Chun. He thought he could throw Ip Man out of the temple in no time. So, this big guy just rushed toward Ip Man. Suddenly, he screamed and fell down to the floor. His right shin bone was almost broken into half by Ip Man’s kick. This person wholeheartedly admitted his own defeat and became Ip Man’s first disciple in Hong Kong. His name is Leung Sheung.” Another story about Grandmaster Ip Man’s kicking skill is one day there was a pickpocket trying to steal from Grandmaster Ip. Grandmaster Ip also used one kick to send him flying. 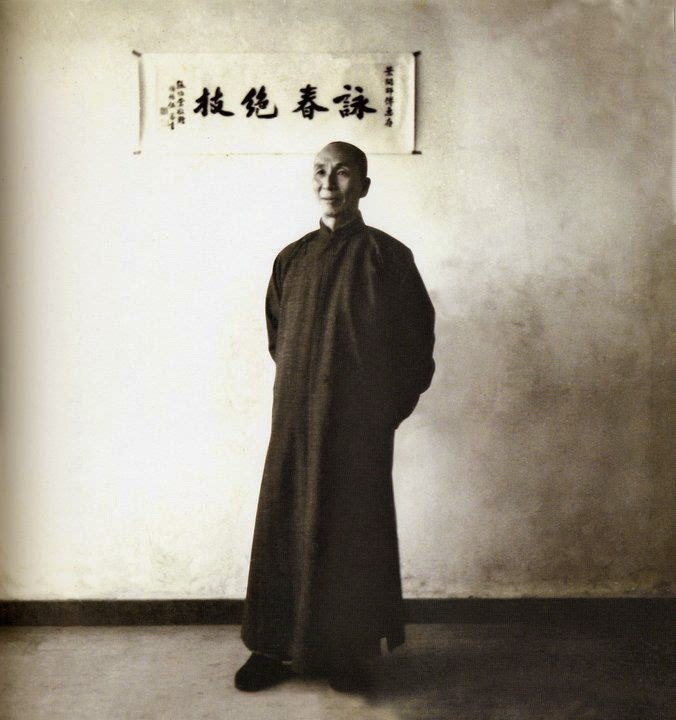 Although, the stories of Grandmaster Ip Man are always interesting for those who practice Wing Chun to hear. However, the main focus of this article is to use these stories to highlight the controlling and kicking skills of Wing Chun, since many people consider Wing Chun is a striking/hitting art only. Some Wing Chun people choose to focus on just “striking” aspect of the art and are very good at it. That’s all fine and dandy. But, for those who are familiar with the traditional Chinese martial art should know most arts compose of four elements: 1. Striking, 2. kicking, 3. Throwing and 4. Joint-locking/Chin Na; to me “Throwing” and “Chin Na” are parts of the Controlling skill. Wing Chun is no exception and has all four elements. Although most people associate Wing Chun with blinding-speed hand strikes, my Sifu Gary Lam encourages us to spend more time working on our kicks to become a more formidable and complete Wing Chun practitioner. Controlling against a fully resisting opponent is really not easy to do; especially when we don't hit him at all. Sifu doesn't want us to stop at hitting and satisfied, he often encourages us to "upgrade" our Kung Fu and work hard on the controlling skill. Personally, if one can do "control", I think one will have more options. Not in all situations we could rely on just "hitting." For example, the policeman or against a drunken friend. In addition, you can choose to stop hurting your opponent and let him go if he agree to stop his aggression. Or, you can choose to put a lot of hurts on him since he is completely at your mercy and can't resist any more. In our Gary Lam Wing Chun system, we put strong emphasis on training Controlling and Kicking in our Level 2 curriculum. 2. Leung Sheung’s story came from an article written by one of his student. Link to the article in Chinese.